CactusVPN is based in Chisinau, the capitol city of Moldova. Romania is a great center for Virtual Private Networks (VPNs), being the home of CyberGhost, VPN.ac, and ibVPN, among others. Moldova is right next to Romania and used to be part of that country. Thus CactusVPN is in good company among the Romanian-speaking community. Although the staff of the company speaks Romanian, the website, app and support system are all written in perfect English. The support staff members are all fluent in English and Russian as well as their native tongue, so don’t let the location of the provider put you off subscribing to this service. Romanian VPN services commonly offer a range of plans that also include Smart Domain Name System (DNS) proxy services. CactusVPN follows this tradition. In this review, you will learn about the Smart DNS methodology as well as the company’s VPN services. The company has a relatively small VPN server network. However, you might find that its Smart DNS option makes up for that shortfall. Although you may not have heard of Moldova, being a small country just outside of the EU gives the country freedom from any EU data disclosure laws. Data services in Moldova are just a short hop from Romania’s superfast internet infrastructure, so, the location has a lot going for it. How Much Does Cactus VPN Cost? Despite having a smaller network than its Romanian counterparts, Cactus VPN is a little more expensive than its neighbors. You can opt to pay for just a Smart DNS proxy, a Smart DNS and VPN package, or a plan that just gives access to part of the company’s server network. As with most VPN services, you can opt to subscribe for a single month or for longer periods. You get a better price per month if you subscribe for a year. 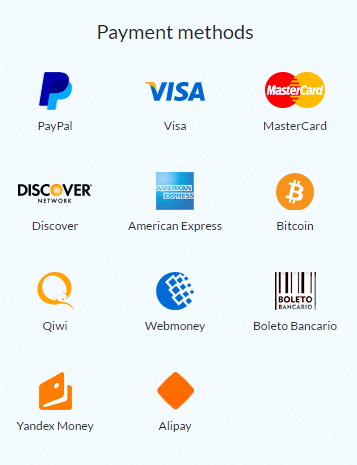 In addition to credit cards, the company accepts bitcoin as a payment method. You can also pay with PayPal, Alipay, Qiwi, Webmoney, Yandex Money, and by bank transfer. Many VPNs allow multiple simultaneous connections – some up to six connections at any one time. The ability to connect many devices at once enables a group of friends or a family to share an account and bring the cost of using a VPN down. You can have a maximum of three simultaneous connections with this service. Cactus VPN has an unusual take on this concept. You can only have one connection to each server at any one time. So, you can have multiple connections, but you have to make sure that you don’t try the same server each time. For some countries this is not a problem. For example, the company has four servers in the United States and six in the United Kingdom. However, this configuration would make it difficult to coordinate usage within a group. If you buy a second package for a friend, you get a 50% discount, so this option might be a better plan for a family. 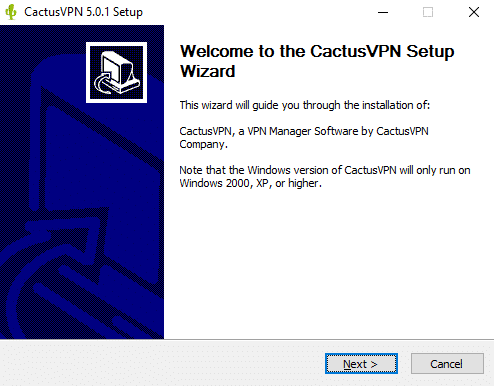 Cactus VPN practices perfect forward secrecy. This means that it issues new encryption keys for each session. The key exchange process could be a security weakness and so this phase also has to be protected with encryption. The company uses 2048-bit Diffie-Hellman encryption for key exchange. Users have a choice of VPN methods that they can select easily from within the app. The application offers Advanced Encryption Standard (AES) 128-bit key encryption. However, most players in the industry use the much stronger 256-bit key. The company justifies its choice by saying that un-crackable security is un-crackable and that getting more un-crackable with 256-bit keys is just a needless overhead. It is true that many VPNs put only 128-bit key encryption in their mobile device versions. This is because full-strength 256-bit key encryption takes a lot to process and drains the battery quickly. The SoftEther implementation that is offered by CactusVPN is not accessible from the app. This methodology includes 4096-bit key RSA encryption for key exchange and 256-bit key AES encryption for the main connection. This is much stronger security than the VPN options that are available in the app. Does Cactus VPN Keep Logs? The company has 20 servers, which are distributed in nine different countries. What Streaming Services Does Cactus VPN Unblock? At the time of writing, the client area of CactusVPN contains a message telling users that the VPN will not work for BBC iPlayer, so the company recommends the use of the Smart DNS service instead to get into that streaming site. Generally, the Smart DNS will get you into all of the streaming services with regional restrictions, as long as you specify the country of the site you are aiming for before you turn the service on. Unfortunately, the Smart DNS service only extends to sites in the US, Canada, the UK, and Germany. From a location in the Caribbean, I selected the US DNS server and then specified a US website location. I tried Netflix, ABC, and NBC. I was able to watch shows on all of those sites. I left the DNS server as US and switched the website location to UK, then turned the Smart DNS on again. I tested BBC iPlayer, Channel 4, and Netflix. None of those sites blocked me, even though they don’t allow access to their shows from overseas. Thus I was able to watch whatever I wanted. When I switched to the VPN with a US server, I was able to watch a show on NBC and also on Netflix US. Surprisingly, the ABC site detected the VPN and blocked me. I tried out the CactusVPN with one of its UK servers and went through my list of BBC iPlayer, Channel 4, and Netflix UK again to see if they would allow me access to their content. Not only did I get into BBC iPlayer, contrary to the advice on the CactusVPN website, but I accessed the same show that I had tried with the smart DNS, and it had advanced while I had the tab closed down. It seems to have continued running while I was away performing other tests. The Channel 4 website spotted that I had been there before, and continued delivering me content that I had previously accessed, even though I had connected before from other addresses. Netflix UK was happy to welcome me back and let me access its shows. All of the VPN tests were carried out using the User Datagram Protocol (UDP) port 555 with OpenVPN. Please note: neither the VPN nor the Smart DNS will get you around the subscription requirements of sites, just the regional restrictions. The reason I was able to get into Netflix for both the US and the UK was because I have a Netflix subscription, and both the CactusVPN services managed to confound that company’s block on the use of proxies to dodge its regional restrictions. The free trial models the VPN and Smart DNS package, so you get to try out all of the bells and whistles of the service before you commit with a payment. If you don’t need servers in all of the locations that the company offers, then you should focus your tests just on the partial services that you are more likely to end up buying, i.e. 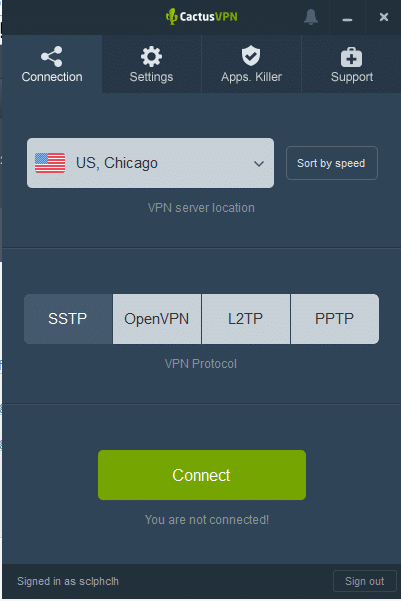 the US, UK, or Liberty VPN packages. The free trial gives you full access to most of the company’s servers, and there are no service restrictions on data usage or throughput speeds: you get exactly the same type of performance that you can expect with the paid version of the VPN. Despite them being missed off the list of available servers, you can access servers in Korea and Australia with the free trial. 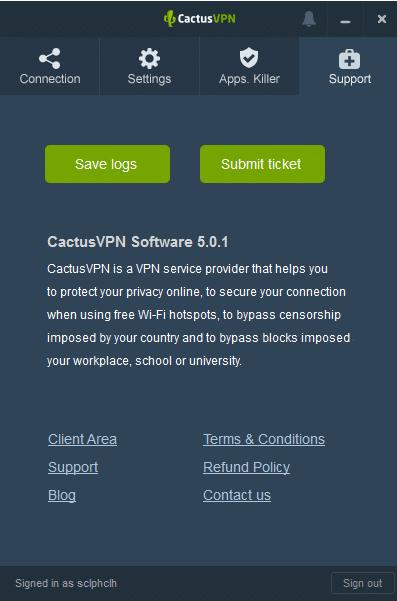 To start the trial, look for the “Try VPN for Free” button on the homepage of the CactusVPN website. 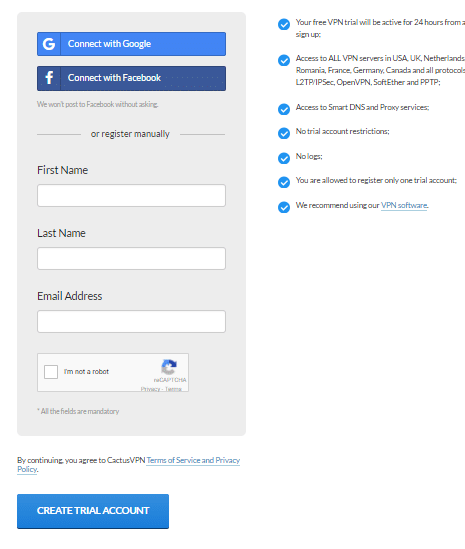 You can sign up with your Facebook or Google+ account. If you want to remain completely anonymous, you could set up a webmail account and give that address, together with a fake name in the personal details section. Your account will be available immediately. Look for the welcome email in your inbox to proceed with the account set up. The email contains a button to take you to the password setting screen. The password setup screen is straightforward. You should then go to the client area. You need to log in with your email address and the password you created. Click on the “Remember me” checkbox so you can get straight into the client area on your following visits. You will struggle to spot the software download section of the website in the client area. 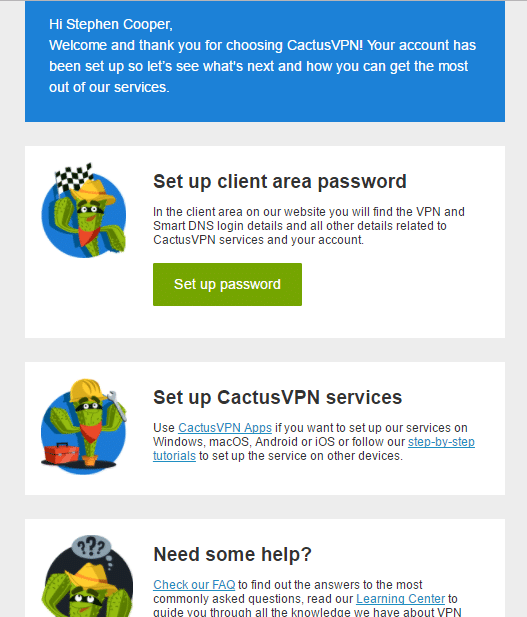 Instead, return to the welcome email and click on the “CactusVPN Apps” link there. When you get to the software page, click on the download button for your operating system. A standard install wizard will open when you click on the downloaded file. Just click through the installation program to get the app on your device. The app should open automatically when the installation process terminates. The install wizard will set up an icon on your desktop. Click on this whenever you want to open the app. You will need to log in the first time you use the app. However, if you check the “Remember password” box, you won’t have to log in on subsequent visits. 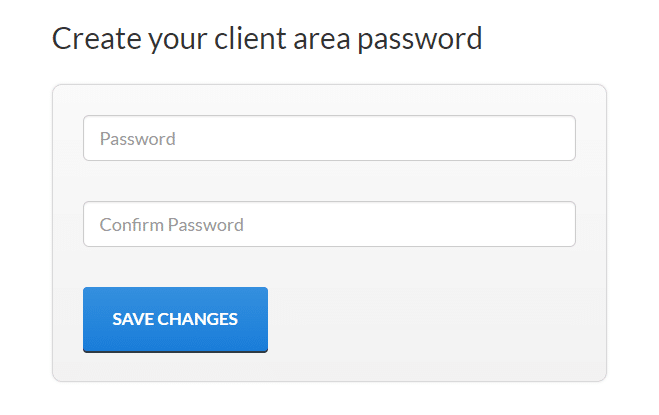 You need a different username and password than the credentials that you use to get into the client area. To get your app log-in details, you need to go back to the client area of the website. Click on the name of your active service package. You can change the generated username and password. However, as you only have to enter these details the first time you use the app, it is just quicker to overlay the app over the client area and type them in once. Unfortunately, the app won’t recognize your account if you copy and paste these details in. The app’s designers managed to pack in a lot of functionality in a very small space. This utility should please everyone, from the casual user through to the techie expert. 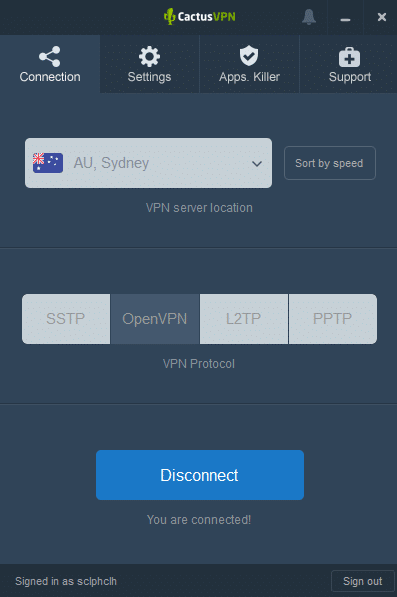 If you are not that interested in the finer details of networking protocols, just select a server location, click on OpenVPN, and press the Connect button to turn the VPN on. The controls of the VPN are disabled while the VPN is running, so you need to disconnect the service before playing around with other options. Server selection is done through a drop-down list. Some VPNs will give a live update on the speeds you would achieve by connecting to each server. CactusVPN has an on-demand sorting feature, which will go off and test a connection to each of its locations and reorder the server list to put the fastest first. A kill switch blocks access to the internet when the VPN is not engaged, whether this is because the connection dropped, or because you turned the VPN off. 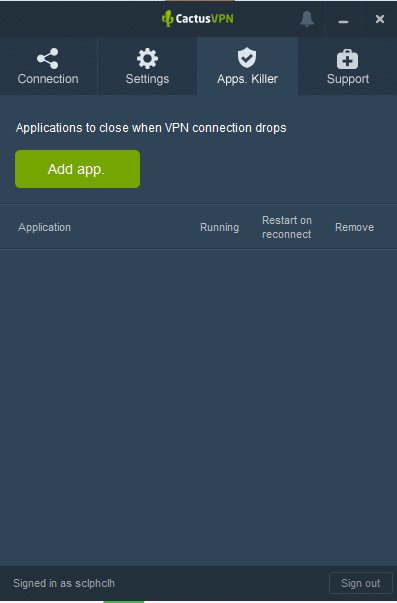 With CactusVPN, you can choose the applications that get locked out when the VPN isn’t active. This leaves everything else to access the internet at will. You get to this function by selecting the “Apps killer” tab and then clicking on the “Add app” button. This opens up the standard Windows File Open interface and you can select each app one by one to build up a list of protected programs. You can’t access the Smart DNS utility while you are signed into the VPN. This may seem a little inconvenient, but it is actually quite sensible. 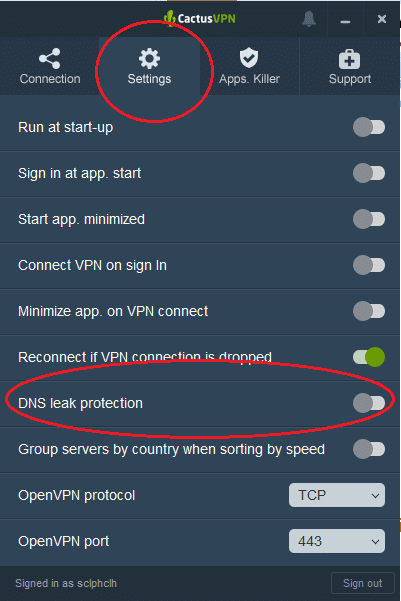 Having both a VPN and a Smart DNS turned on at the same time is a bad idea. This configuration ensures that you don’t try to access both services at once. As a rule of thumb, you should use the VPN when you need total privacy, but use the Smart DNS service when you just want to get around regional restrictions. Back at the sign in screen, click on the Smart DNS tab. 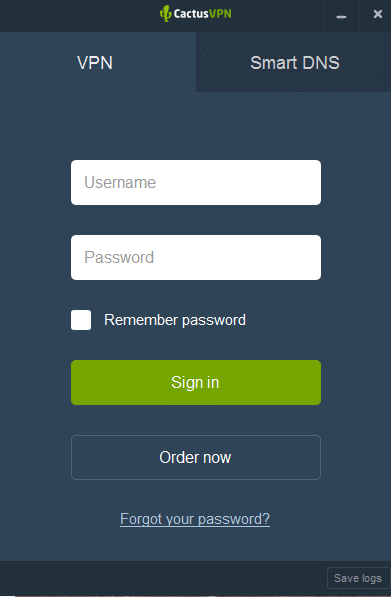 You need to go back to the client area of the website to get the key that is required to log in to this area of the app. You get this by clicking on your package name again (this is where you went to get your username and password for the VPN). Click on the “Smart DNS” tab to get the key. Fortunately, you can copy and paste the key. Don’t forget to check the “Remember key” box. There are just two important settings in this screen: the website region and the DNS server location. The most important of these is the website region. You need to get an address that is in the same country as the server you want to access. The DNS server list just gives the options of USA, Europe, and Asia. The DNS server should be able to mediate with websites all over the world, so pick the location nearest to you. 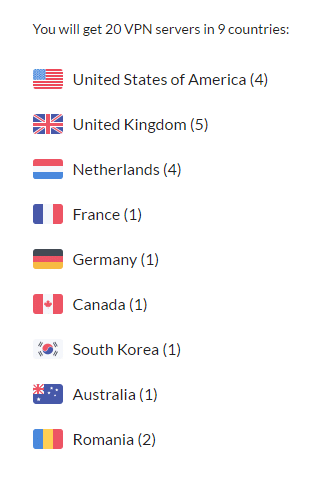 It is unfortunate that the website regions available only cover the US, Canada, the UK, and Germany. Users in other countries will have to try their luck with the VPN to get into streaming services. 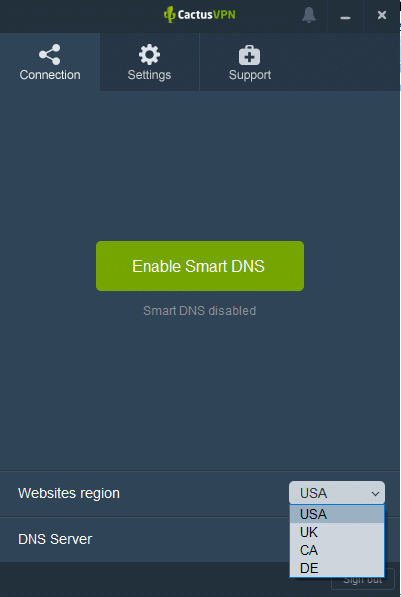 Once you are happy with the server settings, click on the “Enable Smart DNS” button to turn the service on. As with the VPN, you have to disconnect the service before you can change the settings. The app has a Support tab, which can get you access to the helpdesk. When you click on the “Submit ticket” button, the app opens a page in the company website. Periodically, you may visit the site and see that it has live chat available. This is accessed through a picture of a team member in the bottom right corner of the website. When no one is in attendance, the picture disappears and you are left with a web form to start your support experience. You can get to the same page by clicking on the Support option in the client area’s left-hand menu. The form is pretty self-explanatory. A nice feature is the urgency selector, which offers a choice between high, medium, and low. You might think that you would only need to contact the helpdesk in urgent situations. However, I decided to inform the support staff that I was able to get into BBC iPlayer with the VPN, so they could take down their notice in the client area that it didn’t work. In such cases, no one would want a notification message to delay the support staff from getting to the urgent problems. Once you submit a ticket, you will receive an auto-response email. The support staff will reply within 24 hours and a page for your support ticket will be created in the Support section of the client area. You can check back to that section periodically, but you should get a notification email when a reply is ready. The replies you get back will be written in perfect English. 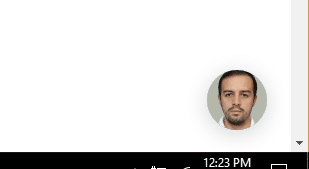 I also managed to catch support analyst Silvano Condrea online in the live chat. His English was faultless and his responses fast. He told me that his Russian is just as good. Naturally, he can write Romanian as well, because that is his native language. By the time I got to the speed tests for this report, I had already used the service to watch streaming services in the UK and the US from a location in the Caribbean, so I knew that both the VPN and the Smart DNS proxy were good enough for these uses. However, now it was time to look at the official results of CactusVPN speed tests. Below you will see the performance of the VPN and the Smart DNS service on connections to Miami and London. These tests were carried out using speedtest.net from the Dominican Republic. If you try your own speed tests, look for the best performance of three trials for each condition, because your internet service can vary and may give you a false impression of the VPN’s performance. A Smart DNS just alters your address – it doesn’t give you the full package of internet privacy that a VPN provides. Thus there is theoretically no reason why a Smart DNS should speed up or slow down a connection. The Smart DNS improved the performance of the line slightly. However, this small change is more likely to be down to the conditions of the underlying internet service. A VPN performs a lot of extra work with encryption, so you might expect that a VPN service would slow down a connection’s response times. However, VPN services enter into better agreement with intermediate networks than cost-cutting Internet Service Providers (ISPs) can afford, and so a top quality VPN can increase the speeds on a bad connection by up to six times. I left the DNS server setting as the US, but specified that I wanted to access UK websites and then tried the connection to London again. The performance of the VPN was disappointing when compared to the rampant speeds that Romanian-based VPNs tend to provide. Should I Subscribe to CactusVPN? I would recommend CactusVPN to anyone. The service is easy to use, works straight away, and connects quickly. The Smart DNS service is also good to have, so it is worth taking out the full VPN plus Smart DNS package. The main criticism I have of CactusVPN is that it has a small network and is more expensive than its Romanian rivals. The slow connections experienced during the tests were the fault of the underlying internet service and not due to CactusVPN. However, I have carried out the same tests from the same location with ibVPN and CyberGohst, and those two services increased speeds by up to four or five times. The location in Moldova should not worry you. In fact, the country is a good place for a VPN becauseit is outside of the EU (which makes frequent attempts at data retention directives). Also, Moldova isn’t part of the Five Eyes surveillance network, or the extended 14 Eyes government snooping agreement. The support staff members write English well and respond to support tickets in a timely manner. However, it would be nice if the live chat could be manned 24/7. Despite the fact that the VPN’s security could be stronger, I would put this VPN in my top ten.